Disclaimer: These are my own thoughts and reflections and not the views of my school, colleagues or local authority. Over the years I have worked with many different Maths teachers – long established professionals, newly qualified teachers, casual supply – but one always comes to mind when the subject of parents evenings comes up. Mr W was in with us on long-term supply and while he wasn’t a Maths specialist he was an ideal supply teacher. The kids liked him, he could control his classes, get them to do work set and was enthusiastic about the subject and the kids. When presented by the department head with a piece of A4 paper with a grid split in to 5 minute intervals he wasn’t sure what to do with it. “What’s this for?” he inquired. “A parents evening? You want me to do a parents evening… FANTASTIC!” he boomed, visible delighted and clapping his hands. Whenever the subject of parents evening comes up and after my default reaction (an audible groan and words to the effect of “Which evening is this going to eat into then?”) has subsided I think of Mr W’s unbridled enthusiasm. That is exactly how we should feel when it comes to engaging with parents. The prospect of repeating the same handful of stock soundbites over a long evening split into five minute blocks does not exactly fill me with joy. Don’t get me wrong. Once you get going on the evening and start talking to the parents there is often a lot of good dialogue but there’s always that feeling of “Surely there’s a better way” at the end. The profession and the curriculum have moved on so much since I started teaching but parental engagement seems to have stood still. In fact, now I think back to when I was a pupil at school a parents evening then would have looked pretty much identical to one today. The original flyer that was to be sent home was very dry and formal and it was a very deliberate decision to redraft it into something with a more light and informal tone. This was very much what we were aiming for with the evening (something that suited me no end!). Basically, we didn’t want to scare anyone off or cause and anxiety in the minds of parents who may have been scared by their own experiences in the Maths classroom! Keeping the evening fairly short was also a deliberate decision – long enough to get our messages across but brief enough not for it to seem a chore. I think, on reflection, we could have done more to promote it. Out of a year group of just over 100 pupils we have just over 20 parents attend. Flyers were issued through registration teachers and it may be the case that some of those flyers are still lying crumbled at the bottom of school bags. I think we, as a department, should have issued the information and really pushed it, encouraging pupils to encourage their parents to come along. I promoted it a bit on my Twitter feed (this was also the case with the main school account) but the infrastructure does exist to get directly in touch with parents through emails and text message and we really could have used that better. Numbers aside the evening was a great success. The three sessions ran smoothly and the feedback from parents was overwhelmingly positive. With events like these and things like classroom observations it is very tempting to put on an all-singing-and-dancing affair which shows you in a very, very positive light but isn’t exactly a true reflection of your day-to-day practice. Our event showcased things we do on a daily basis and demonstrated the type of learning and teacher we are committed to. I think this honesty is one of the reasons the evening was a success. The first session was on teaching for understanding. This is not something new. 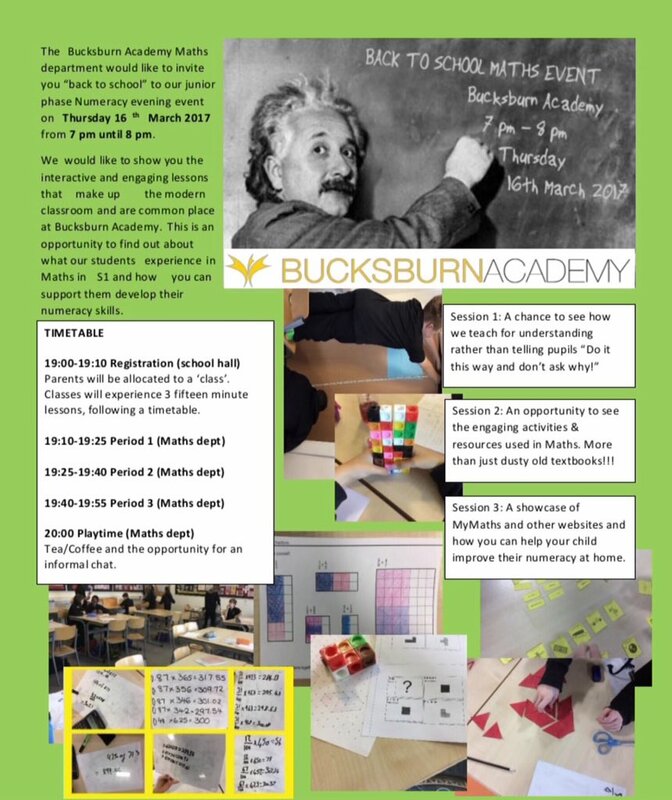 Building understanding has always been a part of effective teaching but recently we have refocused in on it and allowed pupils to discover the rules and shortcuts that make up a mathematician’s toolkit themselves. 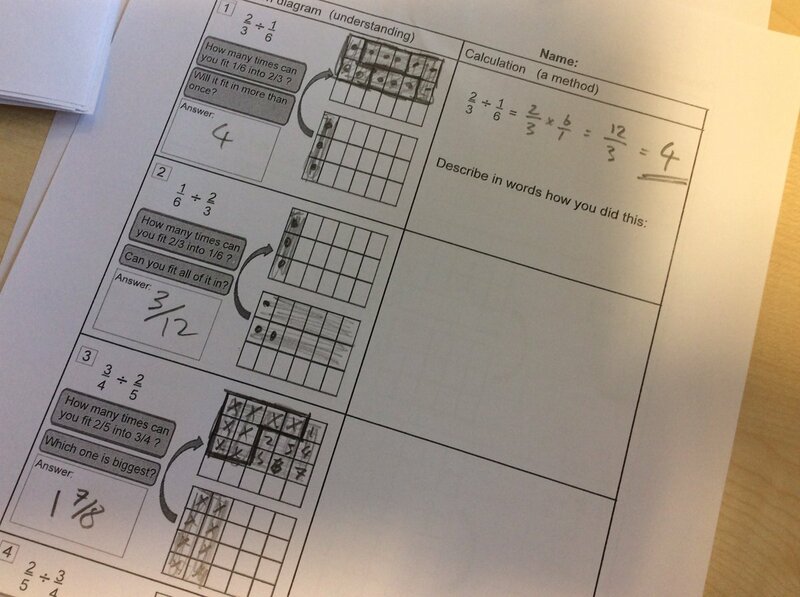 The understanding session looked at division fractions and the use of a grid to let pupils discover the “flip the second one and multiply” shortcut for themselves. I love this task (pictured below) as it really gets pupils to think about what division actually means. A very powerful point was made at the session too that I hadn’t really considered. Using this method of shading in fractions of grids means pupils need to have an understanding of what they mean. They need to be able to picture 2/3 and 1/6 of a grid and know what that looks like. If they aren’t able to do that then there isn’t much point in them going through the motions of dividing fractions by rote using a shortcut. The second session was about the activities and resources used with these classes. While the “dusty old textbooks” mentioned in the flyer will always have a place in the classroom, as will the need for sitting down and quietly working through a pile of questions, it’s much more engaging if there are a varied selection of tasks used in class. 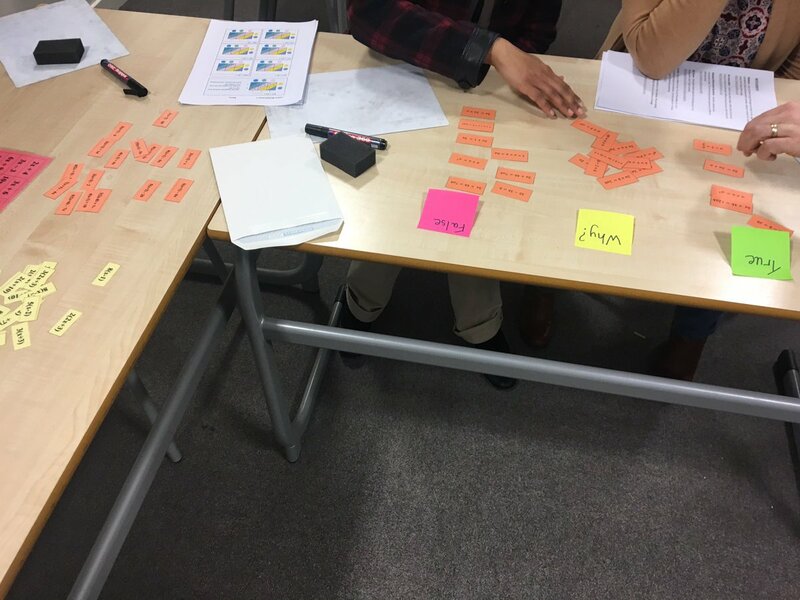 Activities such as card matching, dominoes or the treasure hunt get pupils to interact with each other, discuss their work and, “shock horror!”, enjoy themselves in the Maths classroom. I think this session was probably the most enjoyable of the three as there was a short blurb from the staff hosting it and then the parents well let loose and given an opportunity to use the tasks. Those involved really seemed to get a kick out of trying the activities themselves. The third session, the one I ran, was on what parents could do to support their child’s numeracy / Maths work at home. 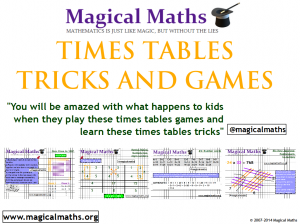 I was able to talk for a short while about some of the excellent Maths resources there are online. 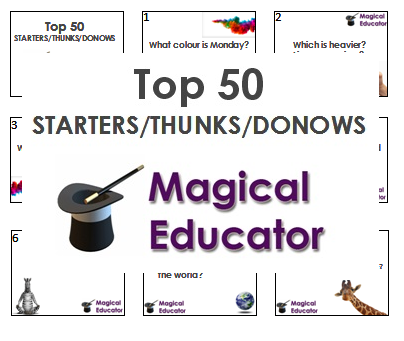 This included good question generating websites – such as the excellent Mr Carter Maths website and the MathsBot Differentiated Questions which provide a never ending source of practice that could be done at home – as well as websites like BBC Bitesize or YouTube that could be used to support any areas pupils needed to work on. Parents then got a chance to attempt some tasks on the MyMaths website using some dummy profiles I had set up and see how the lessons and tasks could be set to meet a pupils individual needs. While I feel the content of my session may have been a bit dry and not as exciting as the other two the hands-on nature of parents using the website gave them something to engage with. The informal chat at the end of the evening was a positive inclusion. I thought it might have been a case of folks just saying “Right, thanks for that, we’ll be off!” before everyone going on their separate ways was but there was a very pleasant, relaxed atmosphere with parents and staff all mingling with one another and talking about the evening without the clock ticking by and the need to rush on to the next session. Parents were keen to know more about all the aspects of what had been covered and were very grateful for the opportunity to see a short “slice of life” in the Maths department. Feedback forms were filled out and I was delighted to see they were overwhelmingly positive. I felt a genuine source of pride in myself and for the whole department when I came across the one below. Are we planning to do the same again next year? Yes. Definitely! The positive response meant it was more than worth the effort of setting it up. In truth while there was a decent bit of preparation put into the evening the sourcing activities and websites was easy as it was all resources we use on a daily basis and had ready to hand as we had used it recently or were planning to in upcoming lessons. Would the following year be a carbon copy of this years? Most likely not – there would be some changes that need to made. We would need to promote the event harder and maybe hold it earlier in the year (given the pupils this was aimed at were almost 3/4 of the way through their first secondary school year when the event ran) but we are hopeful that word-of-mouth will help the attendance to grow organically too. The idea of getting pupils involved would make sense. Inviting pupils in to demonstrate the activities to their parents could be more powerful than staff talking about it. I’m not sure I see this model for parents evenings completely replace the traditional evening of five minute face-to-face slots in the hall but it is definitely a welcome addition and something that might encourage a few more Mr W-esque “FANTASTIC!”s from staff when parent evenings are mentioned. Maths teacher. Twitterer at @BucksburnMaths. ‹ Battle of the “Wrist Bands” ! 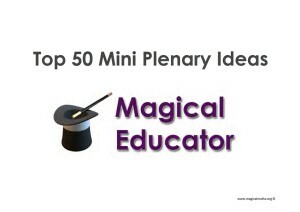 A great way to engage your students in lesson! Love this post. Lots of great ideas to take away to get parents on board. Did you create the fractions division worksheet as a department?